Albert Young and his wife, Margaret started Young Funeral Home in 1916, where it still exists today. During his younger years, he lost a playmate and served as a pall bearer for his friend. This had a great effect on him and the decision for his future profession. He was determined to dedicate his life to the profession of a funeral directing---helping and serving others. Albert surely was dedicated and committed to the community. Albert's first connection with a job as a funeral director was with an undertaking and furniture firm: James C. Berzine in Williamson, NY. what later became a business of his own. Albert learned the art of embalming and the value of the horse drawn hearse back in the day. He did work with various other firms and in 1913 returned back to Williamson and assumed the responsibilities of Berzine's firm with his brother-in-law, Harvey Farnsworth. 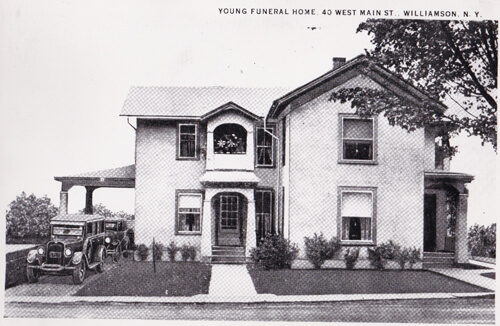 The partnership dissolved in 1916 and Young Funeral Home was successfully established at (40 West Main Street) where the funeral home stands today. Not only was Albert a funeral director but he started an ambulance service in 1919 as well. The funeral home/ambulance service continued to flourish, and in 1936, Donald Young, Albert and Margaret's son joined the firm and continued to work with his dad until his death in 1957. Upon Albert's death, Donald Young along with his wife, Isabel, owned and operated Young Funeral Home and the ambulance service until 1971. The ambulance service was then turned over to the new ambulance base on Bennett Street in Williamson. The Young's took a young man under their "wings" to show him the life of a funeral director. A young gentleman named, P. Gordon Wise worked with Donald Young starting in 1959 as an apprentice. The two gentleman worked together until the sale of the funeral home to P. Gordon Wise on January 1, 1973. Wise continued to serve the community for 40 years. He genuinely served the people of Williamson and the surrounding communities. He maintained the tradition of excellence and high professional standards that was always seen at Young Funeral Home until his death on December 14, 2012. On June 14, 2013, AJ Alvarado and Rick Coe became the owners of Young Funeral Home located at 4025 West Main Street, Williamson, NY. It is our pleasure to have purchased the funeral home from the estate of Gordon Wise, a person who earned the respect of the families he has served and the entire community. We are honored to be able to carry on Gordon’s passion to serve the families of Williamson and the surrounding communities of Wayne County.